As the funk master himself is consistently reaching new heights with his music, he also has an ear for other unique and extremely talented musicians. Always finding ways to blend different styles and make extravagant collaborations come together, it should be no surprise that he’s dropped one of, if not, the hottest remix album of the entire year. Recently dropping a full remix album of his most recent ‘Good Will Prevail’ album, it features a spectacular rework of each individual song on the album by a wide array of artist including Dirty Audio, Boogie T, and Ephwurd(the charismatic duo of Datsik & Baishaus) just to name a few. While this remix album is full of eclectic and unique reworks of the tracks, one in particular sticks out beyond all the rest. 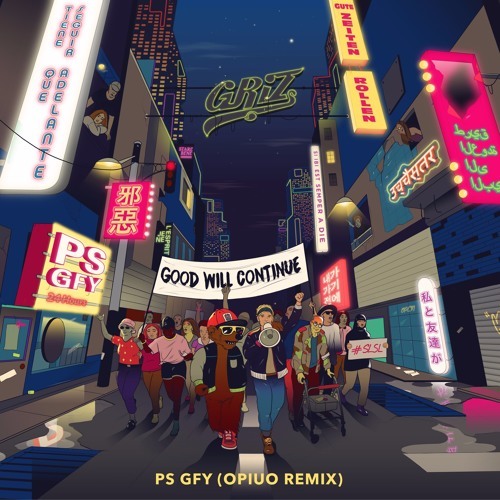 A crowd favorite on GRiZ past tour, PS GFY ft. Cherub, just had an over the top spin added to it. This one coming from one of the glitch-hop masters himself, Opiuo. Taking an already funky track over the top, this ones sure to have you keeping it on repeat for days to come. Give it a listen below.